It was a broadly bullish month for world equity markets, with net monthly changes ranging from +8.1% (Japan), +4.3% (USA - Dow), +3.1% (Germany), +1.6% (UK), to -1.8% (Russia). The mid term outlook into, and across 2018 remains bullish. 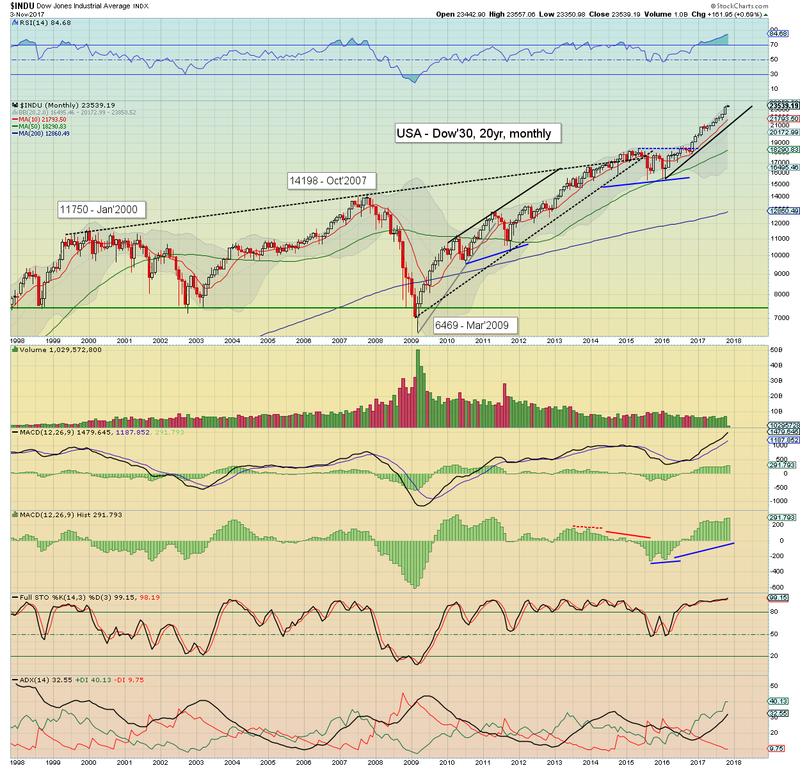 The mighty Dow climbed for a seventh consecutive month, +972pts (4.3%) to 23377, with a new historic high of 23485. Nov'3rd saw a new hist' high of 23557. 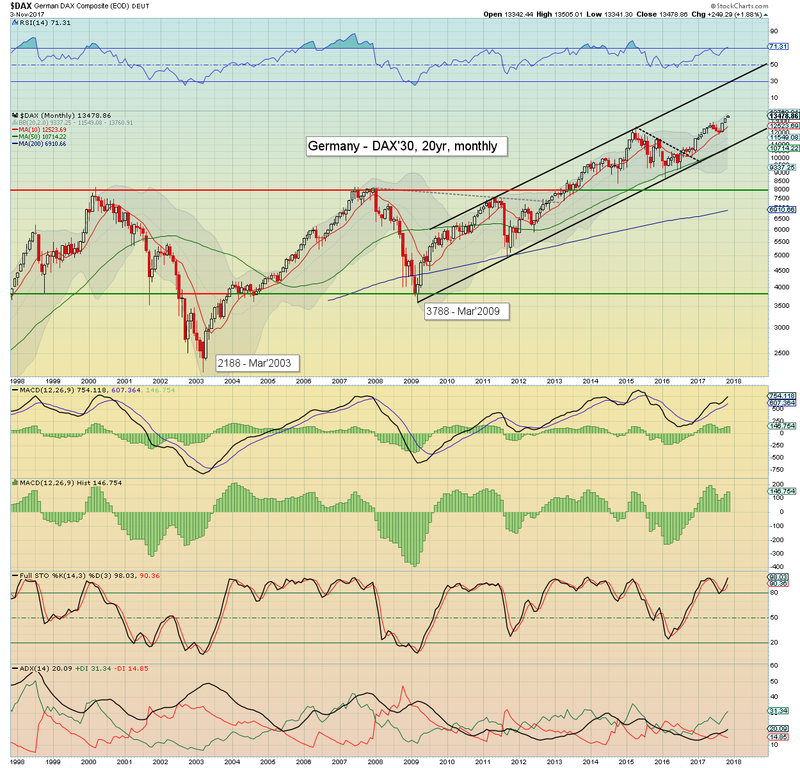 The key 10MA is currently at 21793, and looks set to remain intact into year end. 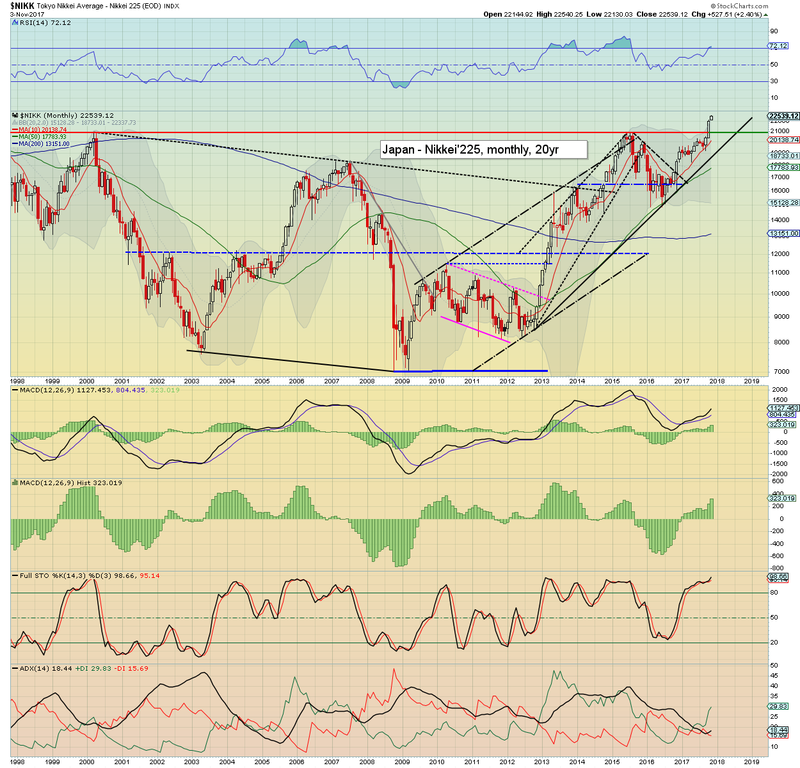 Upper bollinger is offering 23850 in the immediate term, with the 24000s viable in December. Q3 earnings have come in broadly fine, and in some cases (such as INTC, MU, MSFT, AAPL) outright superb. Many companies have raised their outlook for 2018, as they see an acceleration in the economy. The econ-data is supportive of such a view, especially GDP, Chicago PMI, and various sentiment surveys. Best guess: broad upside into year end, probably on the order of 3-4%, which would result in a 2017 settlement within 24250/500. Further, a 'conservative' 25% upside will offer 30k in 2018. 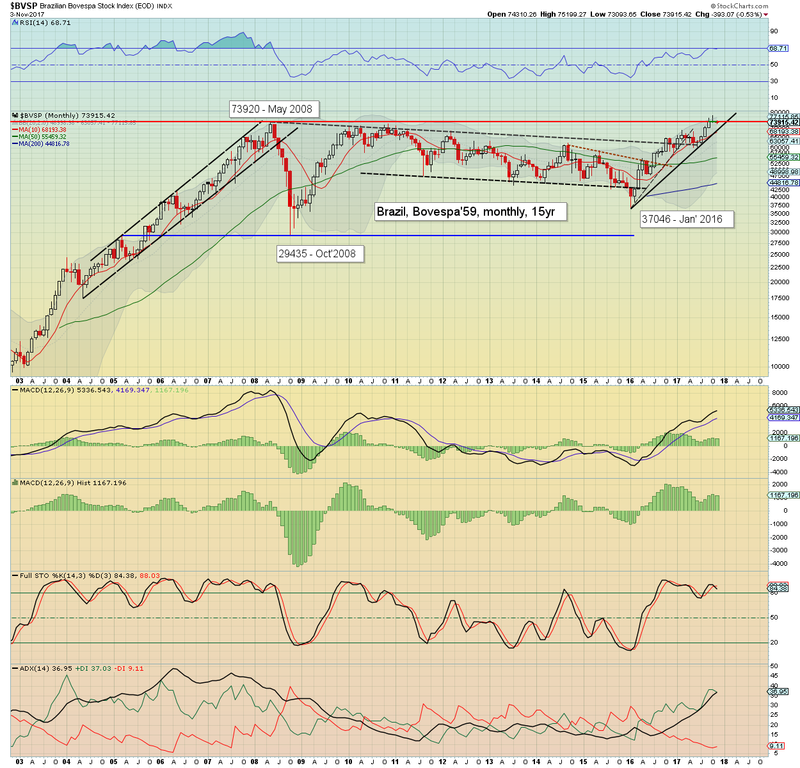 Equity bears have nothing to tout unless a bearish monthly close. 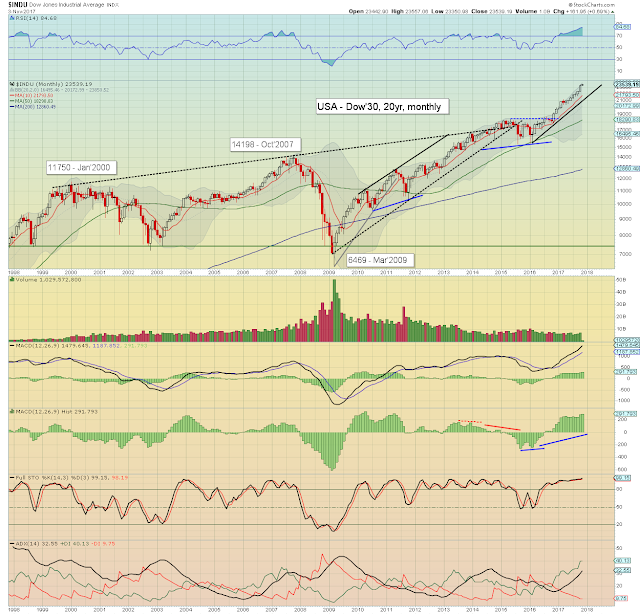 For me, that would constitute a close under the monthly 10MA. I do not anticipate such a monthly close for a very considerable time to come. The economic powerhouse of the EU saw the DAX +400pts (3.1%) to 13229, with a new historic high of 13255.Its notable that the DAX is already net higher for November by a sig' 1.9%, with a new hist' high of 13505. The upper bollinger will be offering the 14000s in December. Things only turn bearish with a monthly close <12500, which looks very unlikely. 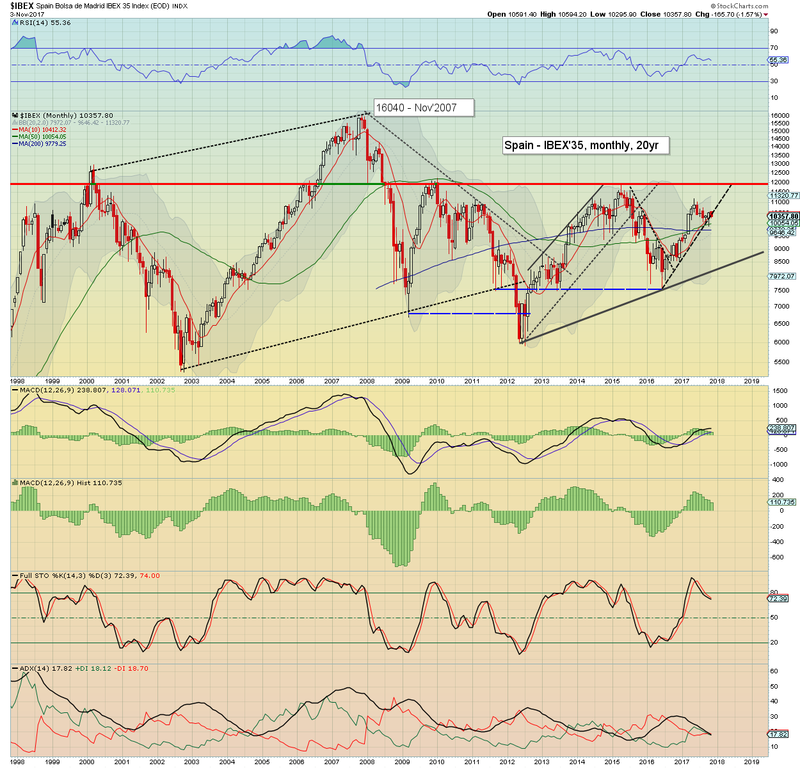 The BoJ fuelled Nikkei soared 1655pts (8.1%) to 22011, the highest close since June 1996. 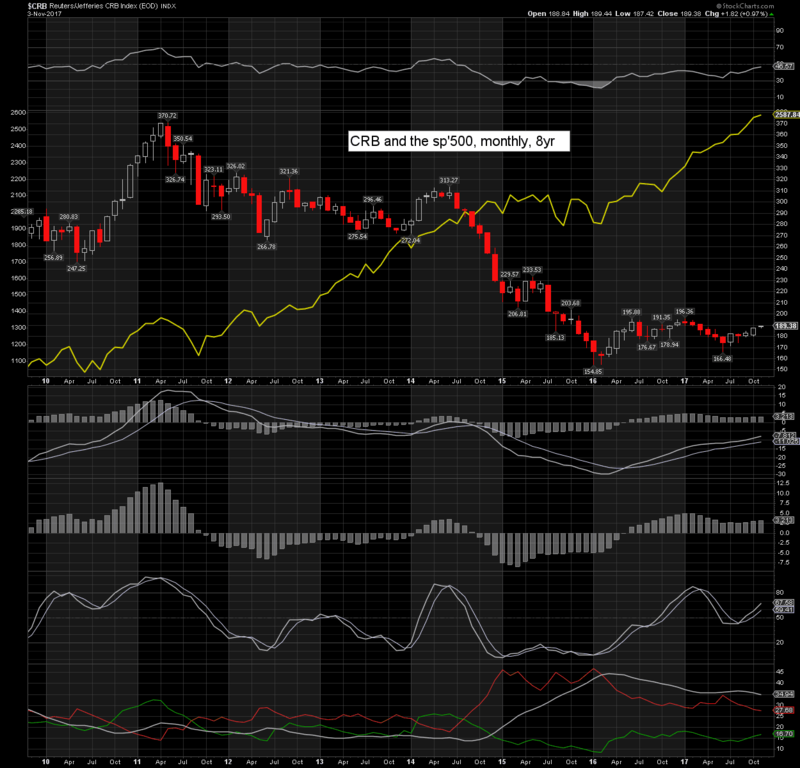 Indeed, the Oct' gain is very important when seen on a multi-decade chart. 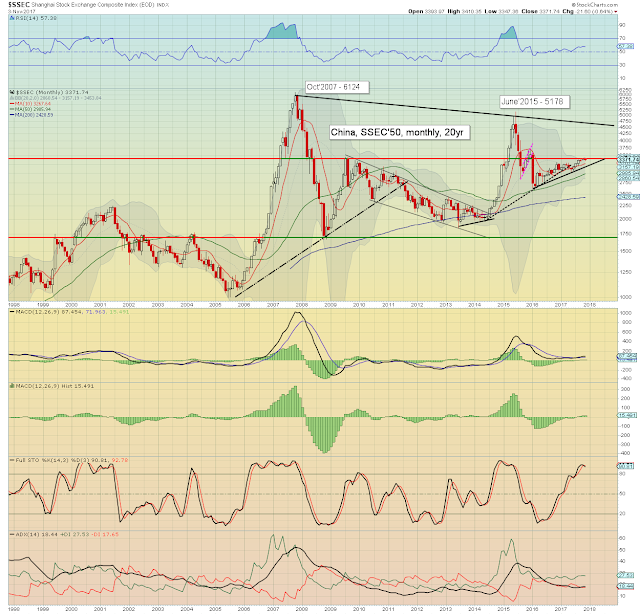 It is a massively important breakout, and offers vastly higher levels. Next key threshold is 26k, then the Jan'1990 high of 38915.80. I recognise the secondary target will be seen as outrageously bullish, but the Oct' breakout is suggestive of it within 2-3 years. Chinese equities gained 44pts (1.3%) to 3393. Broader price action does remain rather muted though, stuck around the key 3400 threshold. 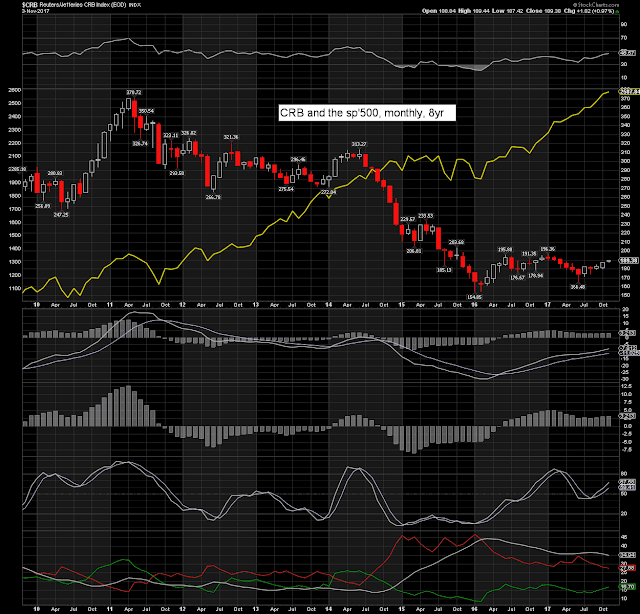 Its notable the upper bollinger is also currently in the 3400s. A monthly close >3500 looks probable by early 2018, and then its 'open air' to around 4500 by late 2018. It was a mixed month for Brazilian equities, with the Bovespa breaking a new historic high of 78024, but settling +14.98pts (0.02%) at 74308. Even though Oct' closed effectively flat, the fact the 2008 historic high has been decisively exceeded is massively important for the mid term. Just consider that the Bovespa managed to break a new high, even though commodity prices are still broadly subdued. Soft target is a monthly close above the Oct' high, and from there, a grander target of 100k by late 2019. Eyes on the CRB, a monthly close >197 would be decisive, and suggestive of at least another 10% by mid 2018, which should equate to BVSP around 85k. 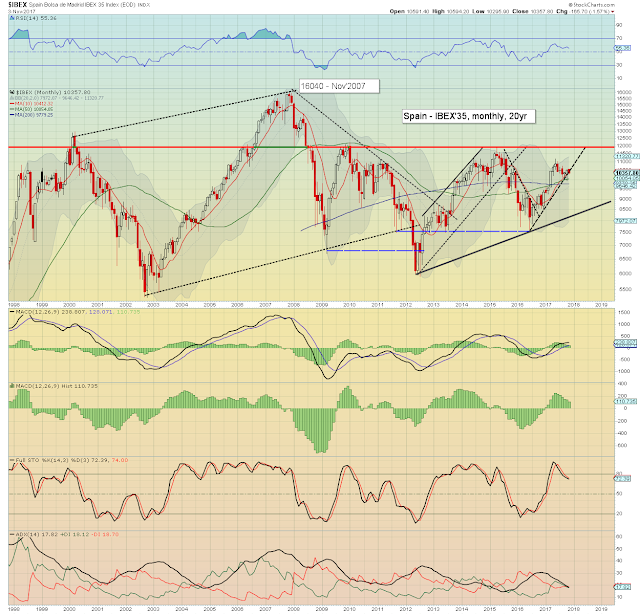 Russian equities leaned weak, settling -20pts (1.8%) to 1111. 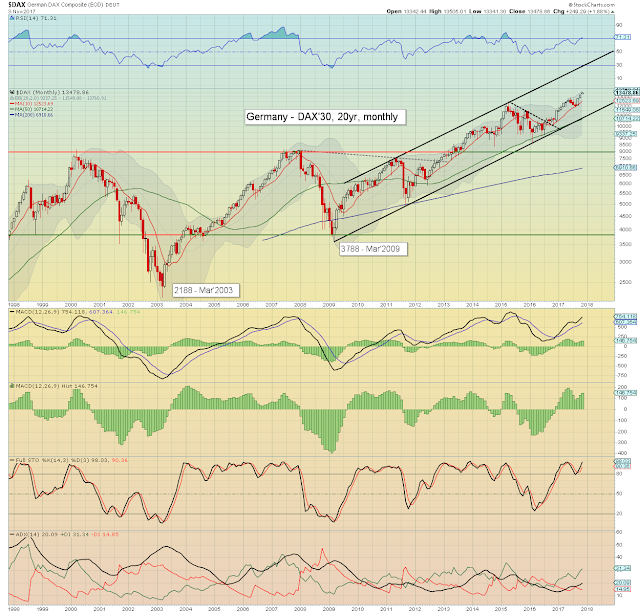 The 1200 threshold remains critical. Mid term bullish trend from Jan'2016 remains intact, an eventual break >1200 appears probable. A monthly close >1200 will offer soft upside target of 1500/600 in 2018. Higher energy prices would really help kick the Russian market upward. Perhaps Putin is hoping for a long cold winter? The UK market climbed 120pts (1.6%) to 7493, and is currently very close to breaking a new historic high. Most important to keep in mind is the monthly close >7k, as achieved in Dec'2016. Since then, price action has been rather choppy, but 7k is holding as new core support. By definition, the break >7k offers grander upside to around 10k. Clearly that is going to take some time, but it looks just about viable by end 2018. I shall add, the UK political scene remains 'unstable'. PM May will very likely quit (or be kicked) by her own (Conservative) party within a year. As things are, Labour leader Corbyn, would likely sweep to power. Corbyn is an outright communist, and it'll be fascinating to see how the UK capital markets cope with such a leadership. When the next recession hits, how many hours would need to elapse before Corbyn is dialling the BoE to initiate 'QE for the people'? French equities gained a very significant 173pts (3.2%) to 5503. Technically, the French market has classic price structure. 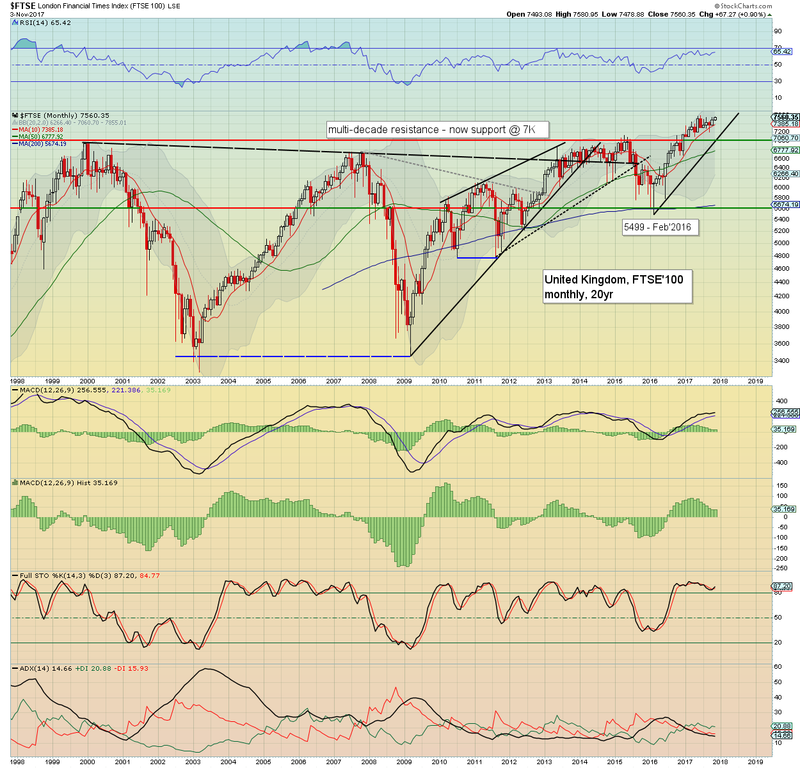 We have a breakout in March, then a back test across the summer, and we're now pushing to new multi-year highs. 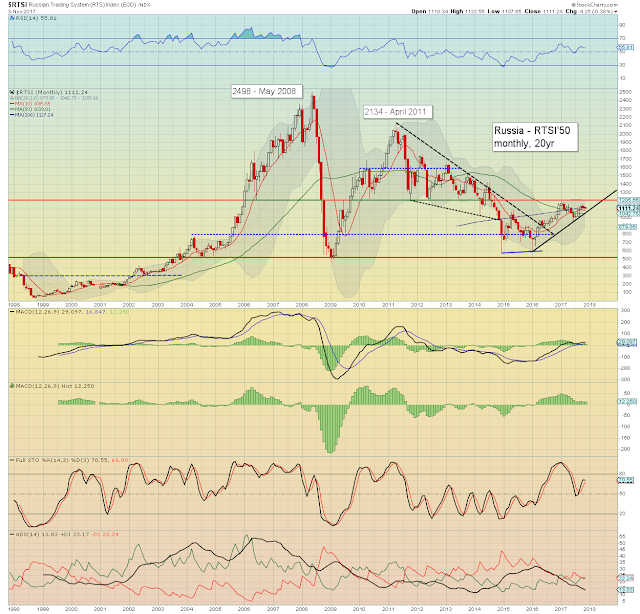 Next soft target is the 2007 high of 6168, which is currently another 16.7% higher. That is most certainly viable by late summer 2018. The Australian market soared 231pts (4.0%) to 5976, notably closing above the April 2015 high of 5963. November has already started on a bullish note, hitting 6037. 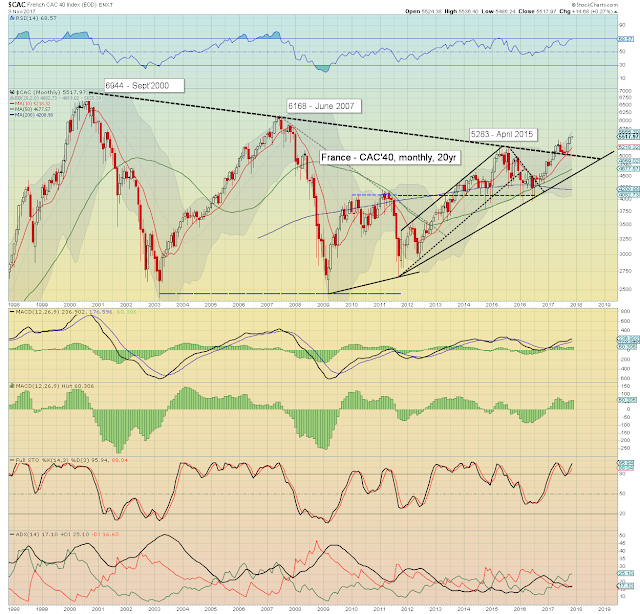 Next big target is the 2007 historic high of 6873, and that is another 14.0% higher. The Aus' market/economy is highly swayed by commodity prices, which have been leaning upward since June. Based on other markets, the 8000s will be a valid target in 2019. Most world equity markets continue to power upward, broadly lead by the US, Germany, and Japan. 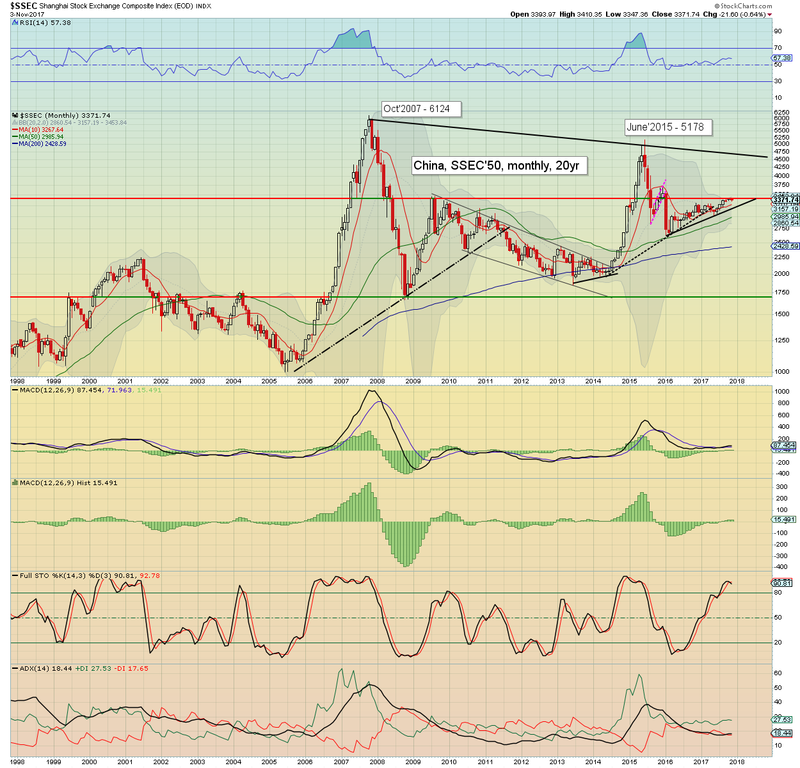 Russia and China are lagging, but both are very close to key breakout thresholds. Commodities appear poised for broad upside in 2018. 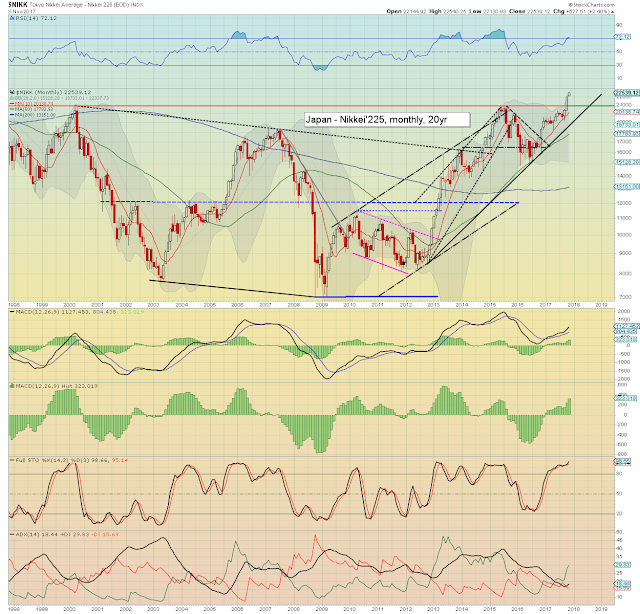 If correct, it will be especially bullish for the BRICs, but all markets would benefit to some degree. The CRB is currently net higher for a third consecutive month, +1.0% at 189.38. The 195/96s are key. 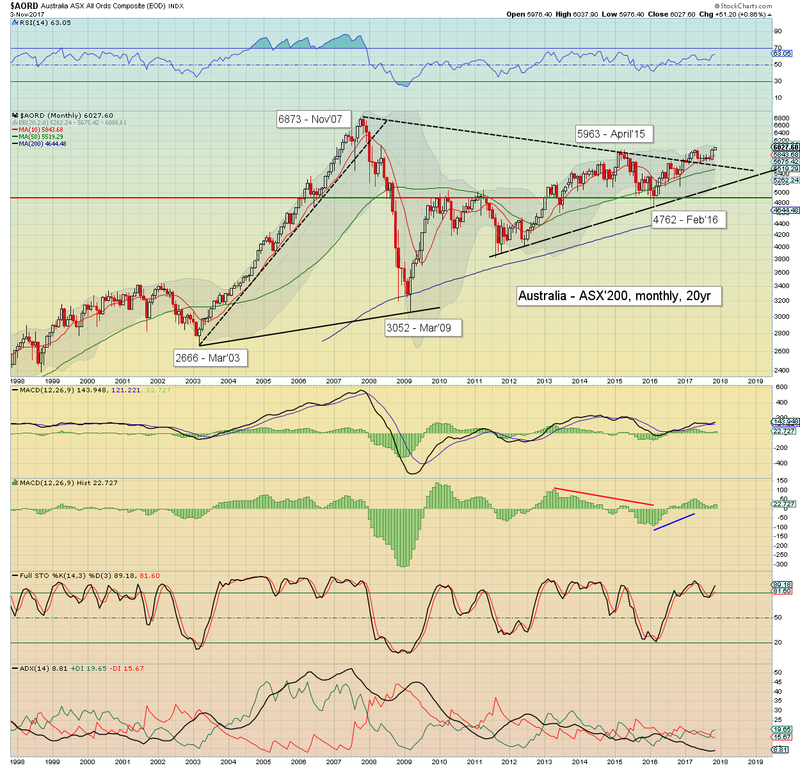 To be decisive, a monthly close >197s, will offer confidence of upside to around 230 by late summer 2018. If correct, that would have massive bullish implications for world equities, and see the current upward trend - from early 2016, accelerate. There are still a fair few corp' earnings to appear, but it will be a somewhat lighter week in terms of data. *the only fed official scheduled is Dudley on Monday - who will be speaking on 'Lessons from the Financial Crisis', which might garner some media attention. **US clocks change in the early hours of Sunday Nov'5th. Yours truly will be glad to return to the normal 5hr difference. If you value my work, and think I'm worth around $1 per trading day, subscribe to me. Yours, bearish food delivery services.